When artist and illustrator Chris Armstrong died on April 23rd at age 66, bass fishing lost its Picasso. I lost a friend and collaborator of over 25 years. It took a couple of weeks to write this. Not because I didn’t know what to say, but how to say it. When you pass certain mile markers, age-wise, a death among your contemporaries and colleagues has a whole different feel to it. For those of you embraced bass fishing at a time when you never knew an illustrator other than Chris Armstrong, you can be forgiven for taking his immense talent for granted. After all, bass fishing was on a roll and seemed deserving of the very best. Actually, we needed Chris Armstrong. Bass fishing needed to take it up a notch and with Chris we got more notches than marks on a gunfighter’s pistol grip. Suddenly, we had someone who created pure poetry gift-wrapped with information. It was groundbreaking stuff of the highest order. 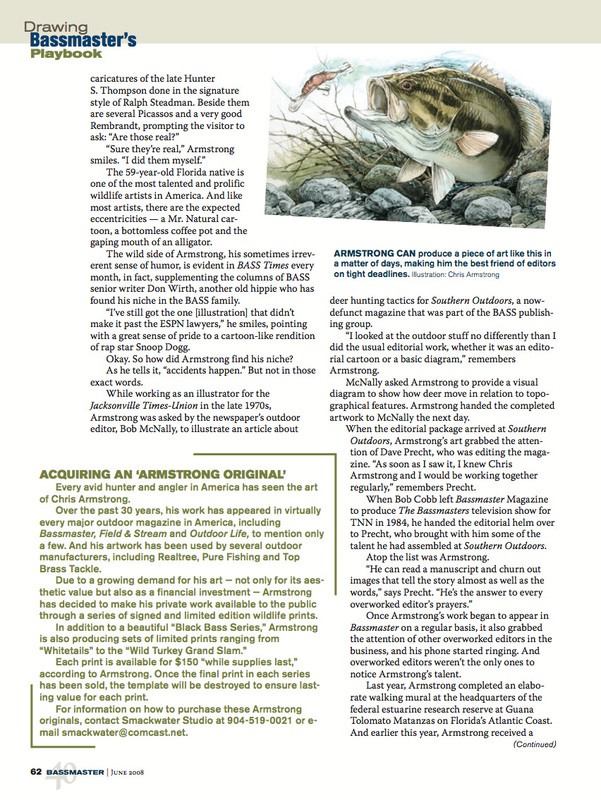 When I first began working with Chris Armstrong at BassMaster® and B.A.S.S. Times® in the later 1980s, there was no email, no texting, no digital anything to speak of. I wrote my stories, covered my tournaments, took my photographs and sent along in my packages to Dave Precht (via the mail or FedEx by the way) prehistoric stick figure drawings for Chris to interpret. From the very start, he got it right. Check that. He got it so much better than right, he elevated everyone’s game. Like a Peyton Manning or a Tom Brady, he made us all look good. Immediately, I wanted to call him up and thank him for his stunning work and so began our long-distance friendship. Chris was in Jacksonville, Florida on one coast and I was in California on the other. In reality, I never really needed to call him about the artwork because we generally spent one minute discussing the job and the next thirty minutes discussing everything else in the world, except bass fishing. Quite honestly, I have no idea if Chris was all that big of a fisherman. It didn’t matter to me because I found him so interesting on every other level. He wasn’t taken with himself or his staggering artistic ability. He was just real. Over all the years, we only met once when Chris made a brief appearance at a BassMaster Classic. He was just the guy I expected and we chatted about everything except the obvious. A lot of what gets labeled as valuable, memorable or legendary in bass fishing isn’t. Quite often, it’s nothing more than what is loud and in your face. Chris Armstrong wasn’t any of those things. He could be forceful and wasn’t shy with his opinions, at least to me. But, more often than not, he spoke with his work - quietly, consistently and spectacularly for decades. He was our Picasso and will always be our Picasso.